Instead of creating contacts or users individually, you can create them in bulk using the bulk upload feature in Configuration Manager. Configuration Manager provides a CSV template containing a minimum or all configurable fields. Each user is specified in one row in the CSV file. You can upload as many users as you desire. The bulk processing tool validates the data on each row and processes the information to create users. You can add and remove the fields from the CSV file. If the system detects missing data or errors, the detailed error report provides specific information for you to fix. Please note that the system does not move to the next step or processing until all rows pass the validation. When the validation is complete, the system moves to the processing stage. The final report includes only the information about the processing results. This indicates that the validation has been successful. Go to Home > Users, and click Bulk upload. In Bulk upload window, click Download .CSV template. In the template, select the desired columns to upload, and click Download template. The basic fields are pre-selected for you. Open the template file, add your user data in the Excel sheet and Save. Gather the guidelines from Bulk User Upload Template Fields. In the bulk upload window, click Drag and drop your .csv or click to browse. Upload the CSV file you just saved and click Validate. The rows are validated top to bottom. A green bar flashes in the header bar if the validation process goes well. After validation, click Bulk upload again, upload your validated CSV file and click Validate and Process. The uploading process starts and the rows are processed. The new users appear in the Users page. You can check out the list of activities by clicking on the top header or by going to the Tasks page from the main menu. Note: You can choose to validate and process instead of validating only. However, all data must be valid before the system starts processing the rows. If there is an error in one row, the operation stops at validation without creating any users or contacts. If the validation process detects any errors in the files, a red bar appears in the header indicating an error message. You can find the report by clicking on the top header, or by opening the Tasks page from the main menu. Download the report. 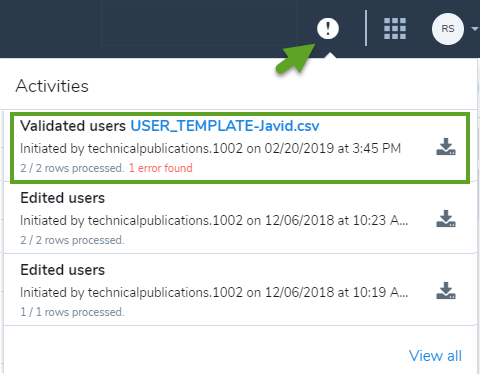 If there is an error during validation, whether you choose validate & process or just validate, you will see the following additional columns in the report besides the user information you provided. User Validate Status Indicates the success or the failure of the user data validation on every row. User Validate Details In case a row fails validation, it provides specific details about the problem. RowSuccessfullyProcessed: This row is processed. See the output columns for the actual results. RowPartiallyProcessed: This user is partially created but with some errors when configuring one or more specified properties. See UploadDetails for details. The user must be edited in Configuration Manager to address the issues. RowProcessingFailed: The user is not created. See UploadDetails for explanation. Once corrected you can upload the row again. User Upload Details Explains the upload status to help you identify the reason and the required correcting step. -You can create up to maximum 750 users in each CSV file upload. To add more users, save them in multiple CSV files. -The large CSV bulk upload operation may time out after 10 minutes. Refresh the application to avoid losing the upload report. The following table lists the basic and advanced configuration fields (mandatory and non-mandatory) used to create users in bulk. Download the basic or advanced .CSV template, add data for your users and save. When you upload the new file to your VO-Configuration Manager, you see the new users you just created in the Home > Users page. You can find any user by searching with their name or extension number under Home > Users. Free text, minimum two characters. Valid special characters: ., &, -, _, ‘ . User.Email R User's email Must be a valid email address. User.Title O User's job title such as Sales Representative or Executive Assistant. Appears in the contact directory as the title. User.MobileNumber O User's mobile number including the country code. The user’s personal contact number such as cell phone. This number appears in the contact directory as the personal telephone number. Excel interprets + prefix as a formula operator. Do not include the + prefix, or replace it with 00. For example, use 14088001500 instead of +14088001500, or 00442070966000 instead of +442070966000. User.Department O User's department such as Sales or Marketing. Appears in the contact directory. User.UserName O A unique username. Use the user’s work email or prefix with the company name to avoid duplications. Valid special characters: ., -, _, @ . If no username is entered, a unique username is generated for this user in the format of CompanyName.FirstName.LastName. If there is a conflict with an existing username, a number is added at the end, such as CompanyName.FirstName.LastName1. Phone number to be assigned to the user as a business telephone number. This field is optional if User.Licenses is absent, but required if User.Licenses is present. If present it makes the User.Voice.PortNumber field mandatory. If the number is claimed, copy and paste it from Phone Numbers page. If you are porting this number, start the porting process (pre-porting at this stage) and request a temporary number to use during the porting period. Excel interprets + prefix as a formula operator. Do not include + as prefix. You can replace it with 00, instead. For example, use 14088001500 instead of +14088001500, or 00442070966000 instead of +442070966000. Note: If you are porting a number, in the upload report, you see a temporary number assigned to this user under User.Voice.TemporaryNumber, while waiting for the porting process. Use this number if you wish to forward your calls during the porting process. This field is optional if User.Voice.Number is absent, but required if User.Voice.Number is present. Y if you are porting the number to 8x8, N if you are using a claimed number. If the number is claimed (already exists in your inventory), copy and paste it from Phone Numbers page. If you are porting this number, start the porting process (pre-porting at this stage) and request a temporary number to use during the porting period. If you don't specify a value, the default answer is No. User.Voice.PortingBatch O The name of the porting batch this number is a part of. The name of the porting batch. This is only applicable to voice numbers that you are porting and provides you a convenient way to group together numbers that should port at the same time. If you would like to port multiple numbers at the same time, group them in porting batches to construct the desired porting order (when initiating the porting request). Voice numbers and fax numbers can port in the same batch. User.Fax.Number O A telephone number including the country code used for the user's business fax number. If the user is entitled to internet fax (this capability is included in the license associated with the user) then assigning a fax number enables internet fax services for this user. Fax phone number to be assigned (with country code). Must be different from the Voice number. If present it will make the User.Fax.PortNumber field mandatory. Note: If you are porting a number, in the upload report, you see a temporary number assigned to this user under User.Fax.TemporaryNumber, while waiting for the porting process. Use this number if you wish to forward your faxes during the porting process. User.Fax.PortNumber O Yes or No. This field is optional if User.Fax.Number is absent, but required if User.Fax.Number is present. If you do not specify a value, the default answer is N.
User.Fax.PortingBatch O Name of the porting batch. This is only applicable to fax numbers that you are porting and provides you a convenient way to group together numbers that should port at the same time. If you would like to port multiple numbers at the same time, by grouping them in porting batches you can easily construct the desired porting order (when initiating the porting request). Voice numbers and fax numbers can port in the same batch. This field is optional if you add this user as a corporate contact with no actual 8x8 services, but required if you provide 8x8 services to this user. Copy the license name from the License page in Configuration Manager such as Virtual Office Virtual Office Ultimate- VOSVC0203-VO Zone 4 - US. If you assign a license to this user, it determine what capabilities the user has. User.Voice.Extension O Valid extension number within the company. Ideally it should follow the company’s internal dial plan (for example, 6 digits if you have opted for 6 digit extensions) but the system accepts extensions of any lengths as long as they are unique. If assigning voice services, this extension is used as the user’s extension. If creating a user as a contact then this extension is used as the contacts external extension information. Copy the device model, such as Polycom VVX 401, from the Devices page in Configuration Manager. No deskphone is assigned to the user. The user still receives softphone access if allowed by the company policy. Note: No DECT phones or ATA devices can be assigned via CSV upload. Enter the device's MAC for remote activation. User.Site R Copy the user's site name from the Sites page. A site is for both users and contacts . Contacts are users without any services. If your business uses the third-party authentication such as Federation ID, you can associate the third-party identity to the 8x8 user. Copy the user's identity, usually an email address found in the SSO directory to this field. User.GoogleID O The identity of the user in the Google system. If your business uses the third-party authentication such as Google SSO, you can associate a Google identity to the 8x8 user. Copy the user's identity, usually an email address found in the SSO directory to this field. Copy your cost center's name (such as San Jose Cost Center) as identified on the order. Associate a specific cost center to this user for billing purposes. Services for this user goes to that specific cost center. SendWelcomeEmail O Yes or No Y means that a welcome email is sent to this user, but N means that no welcome email will be sent. User.Locale O The user's language controls voice prompts, email notification language, and deskphone UI language. If specified, it takes one of the following values: da-DK, de-DE, en-AU, en-GB, en-US, es-ES, fi-FI, fr-CA, fr-FR, it-IT, ja-JP, nl-BE, nl-NL, no-NO, pl-PL, pt-BR, pt-PT, sv-SE, zh-CN. If no value is specified, it defaults to the site’s language. It controls voice prompts, email notification language, and deskphone UI language as a combination of region codes https://en.wikipedia.org/wiki/ISO_3166-2 and language codes https://en.wikipedia.org/wiki/List_of_ISO_639-1_codes. Must be six digits long and non sequential, for example, 123456 is not a valid password. If not specified, the user is required to define the access pin when accessing the voicemail service (555). Y means this user is accessible in the Auto Attendant’s Dial by Name, Dial by Extension and Company Directory flows. If not specified, defaults to Y.
Y specifies that the Secure Real Time Protocol is used to encrypt voice communication for deskphones. Y specifies that this user is a Switchboard admin and the user's license includes the Switchboard capability. Y specifies that this user is visible in the company’s contact directory and accessible via the Virtual Office desktop app and Virtual Office mobile app. It can be any of the timezones defined in the timezone specification. See https://en.wikipedia.org/wiki/List_of_tz_database_time_zones. If not specified, it defaults to user site’s timezone. The user's directory scope can be one the following values: CUSTOMER (the user can view all contacts in the company), PBX (the user can view all contacts in the same pbx), or BRANCH (the user can view all contacts in the same site). The user's contact directory scope shows what contacts the user can see from the directory. If not specified, it defaults to CUSTOMER. User.Voice.Country O The country of the emergency address. The country of the emergency address can have be of the following values: AI, AR, AT, AU, BB, BE, BG, BH, BR, BS, CA, CH, CI, CL, CM, CN, CO, CR, CY, CY, CZ, DE, DK, DO, EE, ES, FI, FJ, FR, GB, GP, GR, HK, HR, HU, ID, IE, IL, IN, IS, IT, JM, JP, KN, LC, LI, LT, LU, LV, MC, MM, MN, MQ, MT, MX, MY, NL, NO, NZ, PA, PE, PH, PL, PM, PR, PT, PY, RO, RS, RU, SE, SG, SI, SK, TC, TH, TR, TT, TW, US, VC, VG, VI, VN, YT, ZA. If not specified, it defaults to the user site’s country. User.Voice.Address O The freeform part of the emergency address. If not specified, it defaults to the site’s address. It includes city, zip code or postal number, for example, 2125 O’Nel Dr. San Jose, CA 95131. Enables emergency services for this user. Y specifies that this user and phone number is registered for emergency services (911 or 112 calls). If not specified, it defaults to Yes. User.Voice.DialPlanRuleSetName O The user’s external calling plan. The user's external calling plan can have one of the following values INTERNATIONAL (allows the user to make domestic and international calls), DOMESTIC (allows the user to make domestic calls only) or EMERGENCYONLY (allows the user to make only emergency calls). If not specified, it defaults to INTERNATIONAL. The user's calling country can have one of the following values: AGONP (Angola), ARENP (United Arab Emirates), ARGNP (Argentina), AUSTNP (Australia), AUSTRIANP (Austria), BGRNP (Bulgaria), BHRNP (Bahrain), BLGMNP (Belgium), BRAZILNP (Brazil), CHLNP (Chile), CHNNP (China), CLMBANP (Columbia), CRINP (Costa Rica), CZENP (Czech Republic), DNKNP (Denmark), FINLNDNP (Finland), FRANCENP (France), GERNP (Germany), GRCNP (Greece), HGRYNP (Hungary), HKNP (HongKong), HRVNP (Crotia), IDNNP (Indonesia), INDNP (India), IRELANDNP (Ireland), ISRAELNP (Israel), ITALYNP (Italy), JAPANNP (Japan), KENNP (Kenya), KORNP (Korea), LTUNP (Latvia), LUXNP (Luxembourg), MLYNP (Malyasia), MXNP (Mexico), NANP (North America), NORNP (Norway), NTHRLNDNP (Netherlands), NZLNP (Newzeland), PERNP (Peru), PHNP (Philippines), PLNDNP (Poland), PRTNP (Portugal), RMNNP (Romania), RUSNP (Russia), SINGNP (Singapore), SPNNP (Spain), SRILANKNP (Sri Lanka), STHAFNP (South Africa), SWEDENNP (Sweden), SWITZNP (Switzerland), THANP (Thailand), TRKYNP (Turkey), TWNNP (Taiwan), UKNP (United Kingdom), UKRNP (Ukraine). If not specified, defaults to the site’s calling country. Y specifies that hotdesking is enabled for this user’s device. If not specified, it defaults to N.
The voicemail notification setting can have one of the following values: DISABLE (notification is disabled), ATTACH_DELETE_ORIG (attach a copy of the voicemail to the email and delete the original), NOTIFY_ONLY (notify the user that a voicemail was received without the voicemail attachment), ATTACH_ONLY (attach a copy of the voicemail to the email). User.Voice.VoiceMail.Email O The user’s email for voicemail notifications. The user's email for voicemail notification must be a valid email address. It can have one of the following values: OFF (call recording has been disabled for the user's extension), ALWAYS (record all calls for the given user's extension), ON_DEMAND (only record calls on demand for the given user's extension). If not specified, it defaults to ON_DEMAND. Y specifies that the external calls made by the user does not include any information about the user. Copy audio file name from the Configuration Manager's audio management dialog, such as audio with note. User.Fax.ReceiveFaxEmailOption O The fax received notification setting. The fax notification can have one of the following values: LINK_AND_ATTACHMENT (attach a copy of the fax and also embed a link to the document), ATTACHMENT_ONLY (attach a copy of the fax document only), LINK_ONLY (embed a link to the fax document in the notification), DISABLE_NOTIFICATION (notification is disabled). If not specified, it defaults to DISABLE_NOTIFICATION. User.Fax.Email O The user’s email for fax received and sent notifications. It must be a valid email address. Y specifies that when dialing inside the company the user’s identity must be visible. If not specified, it defaults to Y. Send fax notification setting can have one of the following values: LINK_AND_ATTACHMENT (attach a copy of the fax and also embed a link to the document), ATTACHMENT_ONLY (attach a copy of the fax document only), LINK_ONLY (embed a link to the fax document in the notification), DISABLE_NOTIFICATION (notification is disabled). User.Voice.AniNumberType O A telephone number including the country code used as the user's external caller ID. Must be a number that already exists in your number pool (user's own number, mainline number or shared number). Copy the number from the Phone Numbers page. For example, use the mainline number as external identity when calling outside the company. Y means that a welcome email is sent to this user. N means that no welcome email will be sent. Site.ReceptionistExtension O Extension number to route to when reaches 0 dialing. The target extension for 0 dial out (if 0 dial out is enabled). Must be an extension already existing in the system. In bulk user upload, why do I need to specify whether or not I want to port a number? When assigning a number to a user you must specify if the number is existing in the 8x8 system or is being ported. If your answer yes, it places the number in pre-porting state and assigns a temporary number to it. Can I use a number that is already in the system, but has a pre-porting, porting, or porting failed status? Yes, you can. When you copy and paste a number from the phone numbers in Configuration Manager to the CSV, specify Y in the PortNumber column (either User.Voice.PortNumber or User.Fax.PortNumber) depending on what you need the number for. What if I cannot figure out the corrective action based on the error message I get in bulk create? Send feedback from the Configuration Manager application and include your report file as an attachment. Our support team will analyze and provide feedback based on your exact system configuration.